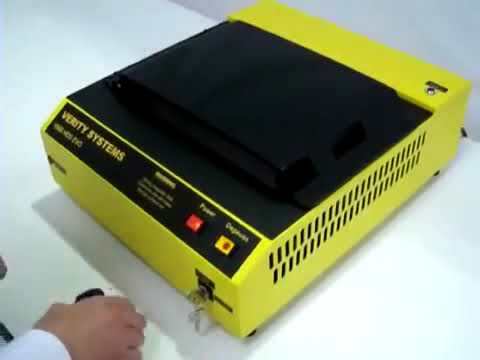 The Verity V660 HDD Evo is a high energy, degausser especially designed to eliminate all data from computer, laptop and server hard drives. The V660 will also erase data from high coercivity tape, including LTO, DLT, Super DLT, AIT and more. Hard drives are completely erased in just 20 seconds, making it the fastest hard drive degausser available. To degauss simply place the hard disc drive within the special adapter, close the lid and press the degauss button. To meet the latest NCNIRP Magnetic Exposure Safety Guidelines, the V660 HDD EVO Hard Drive Degausser can be operated remotely via the infrared control. The unit can also be locked in the manual or remote operation position by removing the key. Key features include quick and reliable hands-free degaussing to erase high coercivity Hard Drives & Tapes with a 7000 peak gauss field. The V660 HDD Evo is supplied with a fully comprehensive return to base 3 year warranty which can be upgraded to 5 years, and FREE lifetime technical support. The V660 HDD Evo eliminates vulnerability of information stored on hard drives which is a recognized security risk. Every time a PC leaves a company’s control, all the data stored on it will go with it. Deleting or overwriting files is simply not enough as someone with the right forensic software can recover ”deleted” files very easily. If the hard drive is faulty, the storage platters will still contain information which could be read once repaired. The only way to safeguard complete and permanent erasure is to use a suitable degausser. Although in most cases this will render the hard drive inoperable, the cost of a replacement hard drive cannot be compared to the cost to a company if sensitive information can be read by a third party.